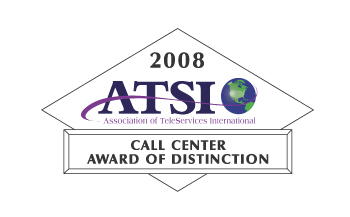 JAM Media Response has been honoured with the prestigious 2008 Call Centre Award of Distinction by the Association of TeleServices International (ATSI). The industry's Trade Association for providers of Call Centre services including Inbound Order Desk/Help Desk and Web enabled customer assistance recognised JAM at ATSI's 2008 Annual Convention. The Call Centre award of Distinction was created in response to overwhelming requests by Call Centres across the World for a tool, which could be used to measure the skills of their professional call centre operators. After six months of testing, an independent panel of judges scored call handling skills for "enhanced service" applications, focusing attention on customer relationship management (CRM), courtesy, etiquette, and the proper use of call techniques, as well as response time and accuracy, the cornerstones of the Call Management Industry. "The Award of Distinction is a 'mystery shopper' program that provides independent testing for quality assurance in customer service levels." says ATSI President Allan Fromm. "We congratulate JAM for their achievements." ATSI extends its congratulations to the staff of JAM on their proven quality service to the customers.